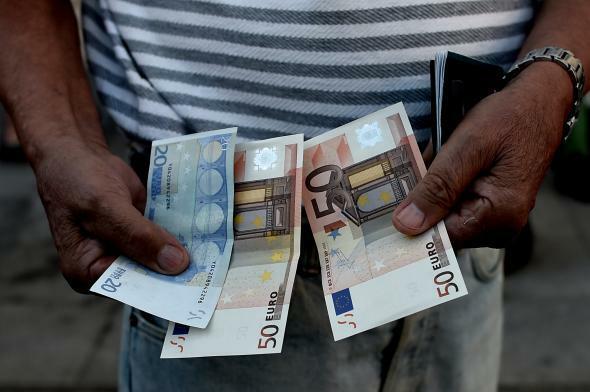 A pensioner holds banknotes next to people waiting outside a national Bank in Athens on July 1, 2015. The markets seem to believe a deal is still reachable, with European stocks rising today on the news of the proposal, but it’s hard to avoid the conclusion that both sides are going through the motions. Meanwhile, with banks closed for the last 10 days, Greeks are already gradually moving into a post-euro economy, with many businesses, particularly in the important tourist sector, deciding to accept Turkish lira and Bulgarian lev. The majority of Greeks still want to keep the euro, and most European leaders would marginally prefer for it to stay in the eurozone, but at this point it’s hard to see a deal that will satisfy both European creditors and Tsipras’ supporters. However it turns out, it seems unlikely that this is the last meeting about Greece Renzi will have to attend.